” I just wanted to give a shout out to John Rossi and his team from Visible-Good (http://visible-good.com/) for helping us on Friday to move the shed that they designed. 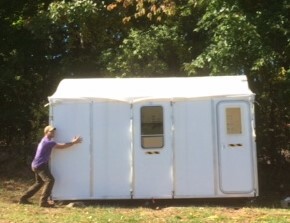 Ben from the FOOD PROJECT is proudly HUGGING his Shelter.from our smaller field on the north side of Larch Row to the bigger field on the south side. They generously took time out of their day to teach me and Susan how to disassemble and reassemble their genius RDM structure that Felix Twaalfhoven donated and Visible-Good delivered last Spring. I’m super-thankful for the generosity of Felix and John to provide us with a great (mouse-proof!!!) storage/office space at our Wenham Land!